I could never relate to women who drooled over good-looking men. I just didn’t get it. And then I turned 38. Now I understand where all those ladies were coming from. A couple of years ago my husband, Daryle, and I bought a house on a hill with a lovely view of the Alex Fraser Bridge in Delta. It had been quite neglected: stucco siding with chunks missing, carport showing signs of wanting to slide downhill, rotting retaining walls, a 30 foot stump and its trio of neighbouring trees that needed either bringing down or a thorough cleaning. The list goes on and on. Our neighbours even commented on how neglected our trees had become and how they had been the most beautiful trees in the entire area at one point. Hmm. After two years of being inundated with repairs around the property, Daryle told me to proceed with getting the trees taken care of. He handed me a flyer and told me to call for a quote. Okay, deep breath. In – out – in again. I can do this. After all, I am an office manager, strong woman, and only need to make a quick phone call and talk to someone at the other end. No big deal unless picking up the phone puts the fear of God into you. I managed to procrastinate on making the phone call for about two months. Descending from a long line of procrastinators, I’m a born natural. But after beginning to have nightmares about making the call and desperately wanting to plant my new spring-flowering bulbs, I finally picked up the phone. Relief, nobody answered. So I left a quick yet ridiculously-phrased message. When Sarah called me back she gave no indication that she felt I was slightly deranged. Within a minute we made arrangements for someone to come out and give me a quote. The company owner, James, arrived to give me a quote. He was very handsome: smooth complexion, balanced features, strong jawline and a relaxed, yet professional manner. However, he didn’t appear old enough to have any experience in the industry, let alone be able to provide a knowledgeable quote. Grabbing my grubby gardening shoes, I took him into our back garden. We discussed bringing down the tall dead Douglas fir and tidying up the trio of two firs and a cedar. The large cedar in the front yard didn’t need any attention yet, just some maintenance in a couple of years along with all the other trees that had been topped. I pointed out that there were several dead limbs suspended in the firs. He seemed confident that they’d be able to easily bring down the fir and tidy the trio. He quoted a cool $600, well within my budget of $1,000. Okay, he was fully capable of providing an knowledgeable quote. I was thrilled: I’d be able to get all the work done at a reasonable price and get my bulbs planted before winter! Two weeks later James’ crew was scheduled to arrive. I booked the morning off work to make sure they did exactly what I wanted. When they made their appearance, half and hour late, they introduced themselves: Brad (OMG!!!!! ), Sam and Jonas. Brad was tall, very athletic and had the most gorgeous blue eyes I’ve ever seen (aside from Daryle’s of course). I was so taken with him that I forgot his name instantly, focusing only on his chiseled facial features. I felt a little foolish trying to pick up his name during conversation. The other two seemed very fit, friendly and eager to get on with the job, but they were nothing compared with the Richard Armitage good looks of Brad. After discussing the trees and what was to be done to them and where the wood was going to be stacked, Brad asked if I was partial to the plant at the foot of the big dead fir. The rings sawed from the stump would probably obliterate it. “Oh, not at all. It’s just parsley, I’ve got some more elsewhere in the garden.” Jonas, upon hearing this, proceeded to pick a stem of parsley and eat it. I laughed and told him there was some mint and oregano that he could help himself to if he were so inclined. Without any further delay I took my leave and went inside the house. After closing the door, I had to brace myself. Picture me leaning back against the door, arms out at my side with palms against the door. Big sigh. I was smitten. Sad, sad thing for a married, 38 year-old to be. But I was. Very. Watching the crew, especially Brad, through the living room window was the most entertaining thing I’ve done in a l o n g time. I had to keep myself occupied with other things around the house just so that I wouldn’t creep the guys out. But they were absolutely riveting. I found myself returning to window more times than I care to admit. The sound of the chainsaws, the sight of Brad climbing, and the strength and confidence all of them displayed, was breathtaking. I couldn’t resist calling Yvonne at work to tell her about them. Then it occurred to me: pictures. I needed to take some pictures. How though, without looking like some sort of deranged, lonely, housewife stalker? The simple answer; when they weren’t looking, of course. 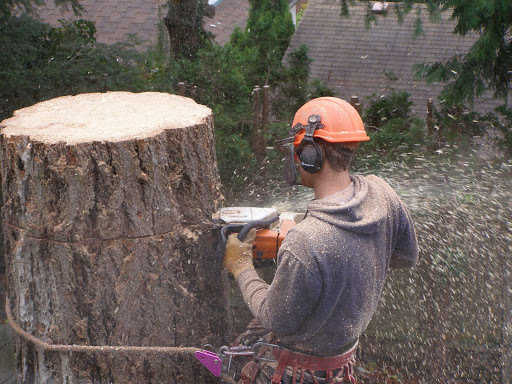 I managed to get some good shots of Brad climbing and sawing while working on the big fir stump. Really he was only a few feet away from me with only the window between us; I would have been a terribly poor shot if the photos hadn’t turned out. Meanwhile, the garden took a bit of a beating. I watched while branches fell on my newly planted laurel ‘hedge’. WHACK!! My attempt at naturalizing some ferns – WHACK!! The poor parsley plant – WHACK!! The ground at the base of the fir compacted a little more with each thud of a ring from the dead fir, leaving a big hollow spot about two feet across. But I’m a big girl, I can cope. It will just mean that I’ll have a cleaner slate with which to begin planning the garden. When the fir was nearing the height I wanted, Brad looked up and made gestures that appeared to ask if I wanted another ring taken off, or if the height was fine. I replied in similar fashion indicating that one more ring needed to come off. It’s amazing how easy it is to understand each other just by waving our arms about a little. After falling the twentieth ring, he carefully trimmed the raw edges of the stump. Perfect. Throughout the entire project Sam and Jonas were kept very busy. They picked up limbs and debris as it fell and disposed of them up at the chipper in the driveway. They also passed things up to Brad as needed, like the extendable pole saw, small jug of gas for his chainsaw, a different sized chainsaw, just to list a few items. When all was said and done, I must say that they did a great job minimizing the debris left behind. Brad made sure they cleaned up after themselves and even directed them to clean up some of the sawdust. Jonas fired up the blower and Sam picked up the rake to begin tidying the sawdust. Noooooo! I didn’t want anyone walking, raking or causing any further damage to my garden, so I bolted out of the front door to run down into the yard to talk to Jonas and Sam. Hurry – quick – panic. I’m sure I made quite a noticeable exit from the house, arms flapping trying to pull on my jacket then reaching down to tug on my gardening shoes. When I stood up, dressed in my clownish attire of black slacks, red and white blouse, stained runners and turquoise all-weather jacket, to my great surprise Brad was standing shirtless in the driveway brushing sawdust off. Oh my! Must avert eyes – but really don’t want to. Instant visual of helping him wipe off the sawdust. I think I’m in heaven. I’m sure he had seen me, so I couldn’t make the situation more awkward than it already was by running back inside as though I had something to be ashamed of. Casually, as though I’m used to gorgeous men standing in my driveway half-starkers, I strolled across the driveway to go down to the back yard. Oh, that I could have taken a picture of THAT. In A&E’s version of Pride and Prejudice, Colin Firth goes for a swim in his lake, looking rather stunning in his dripping-wet shirt when he emerges from the water. Well, Brad in my driveway was my coming-out-of-the-water equivalent! By this time it was about 1:30 in the afternoon. With a quick change into appropriate shoes and a wrap, I was dressed for work and really needed to get going. After paying Brad and telling him that they did an excellent job, I said that I really needed to leave. Jonas finished blowing debris out of the driveway and Brad moved the truck out onto the road. After all three of them had climbed into the truck, I had to smile at the thought of three grown men squashed together while two of them changed their sawdust-covered shirts. Then when I drove by, all three of them waved. Be still my heart. I walked on air for the rest of the day.